Our teeth are covered with a sticky film of bacteria, called plaque (sounds like PLAK). When we eat or drink anything that contains sugar-such as cookies, candy, soda, juice, or sports drinks-bacteria turn the sugar into acids that can attack tooth enamel. Over time, these attacks may cause tooth decay, or cavities. The good news is that there is a way to protect teeth and prevent decay: dental sealants. A dental sealant is a plastic material that is put on the chewing surfaces of the back teeth. The sealant material flows into the pits and grooves on those surfaces and acts like a barrier, protecting enamel by "sealing out" bacteria and bits of food. That is how decay starts in the pits and grooves and cavities form. To keep decay from starting here, the dentist may recommend dental sealants. Your teeth are coated with a sticky film of bacteria, called plaque. Bacteria turn the sugar in what you eat and drink into acids that can break down the hard, outer layer of teeth, called enamel. Over time, the acid can weaken the enamel and may cause tooth decay, or a hole to form in your tooth's enamel (cavity). Tooth decay often begins on the chewing surfaces of the back teeth. These surfaces have pits and grooves where plaque, bacteria and bits of food can get trapped. Just like in the pictures below, toothbrush bristles can't reach into the pits and grooves, and it makes it hard to keep them clean. Your dentist may recommend dental sealants to keep decay from starting on these chewing surfaces in the pits and grooves. 1. Your tooth is cleaned and the chewing surfaces are prepared to help the sealant materials stick to your tooth. 2. The sealant is painted onto the chewing surface where it bonds to your tooth and hardens. 3. A special light may be used to help the sealant harden. Sealants are smooth and you can't feel them on your teeth. They are usually clear or white and can't be seen when you smile or talk. Sealants usually last several years before they need to be replaced. Over time, sealants can come off, which means they may not protect the teeth as well. Chewing on ice or hard foods can also break down sealants. During regular dental visits, your dentist will check your sealants and reapply them if needed. 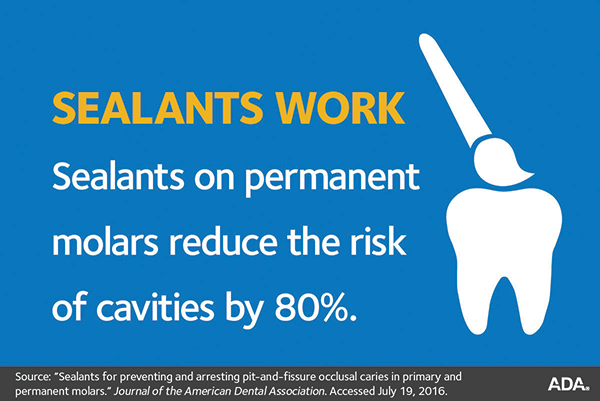 Research has shown that dental sealants are safe, and they are effective. The American Dental Association recommends that dental sealants are an important step you should take to lower your risk of tooth decay and cavities. If you have any questions, talk to your dentist. Sealants are recommended for children and teenagers, since tooth decay can start soon after teeth come in. But, you never outgrow the chance of tooth decay and cavities, so adults can benefit from sealants, too. A sealant can be placed on a tooth that does not have a cavity in its pits and grooves. If your tooth is stained or has slight decay, your dentist may suggest you get a sealant, though other treatment may be necessary. If your tooth has more advanced decay or has a cavity, it will need a filling. Prevention is always better than treatment! Sealants are very useful in preventing tooth decay on the back teeth and can save you money over time. Your dentist can make sealants part of your plan for a healthy mouth. Sealant photos courtesy of Dr. Adam A. Francois.